Progress has been made in the master bathroom with freestanding tub, and it’s majorly pretty. 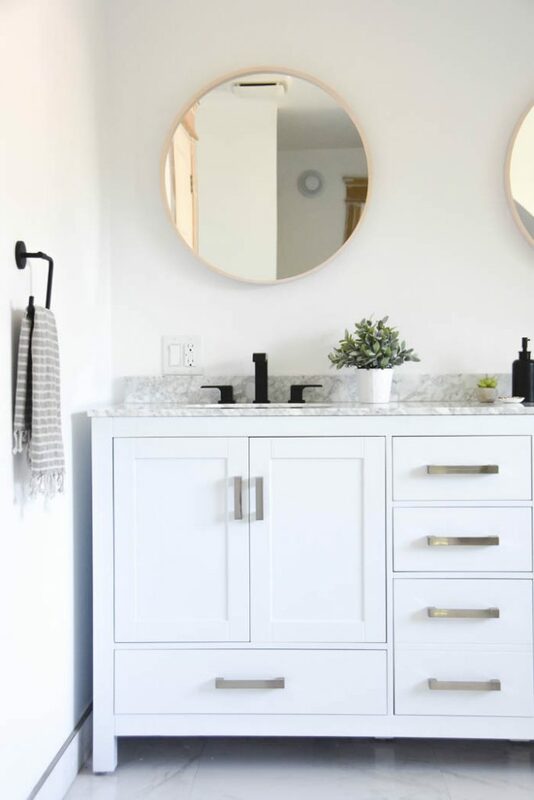 The last time I updated you on our master bathroom makeover was when we had installed the gorgeous double vanity from The Home Depot. If you pan over from the vanity, there was a large gaping hole under the window. 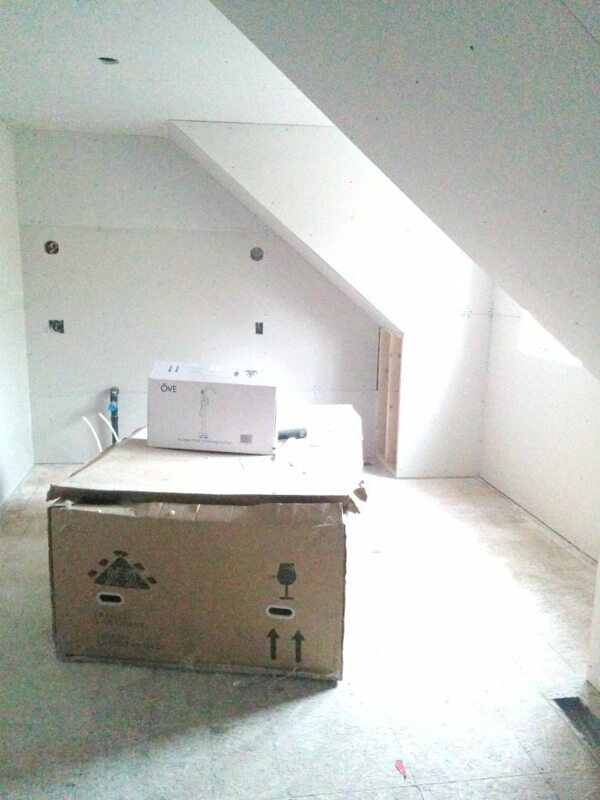 You can see the space I’m talking about in this early-reno pic. See that spot in between the sloped roof lines? Well, that spot had been specifically designed for a soaker tub and it was time to get that baby in!! 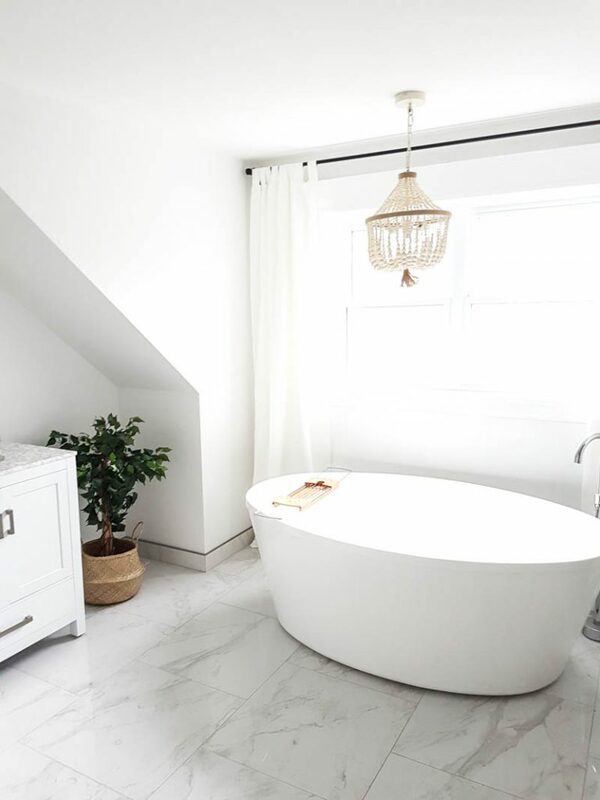 When we were doing the addition on our house in 2014, I didn’t think such a big bathroom was going to be possible, but once we started drawing things out on paper we realized that we could absolutely make the bathroom big enough for a freestanding tub and separate shower. So dreamy. 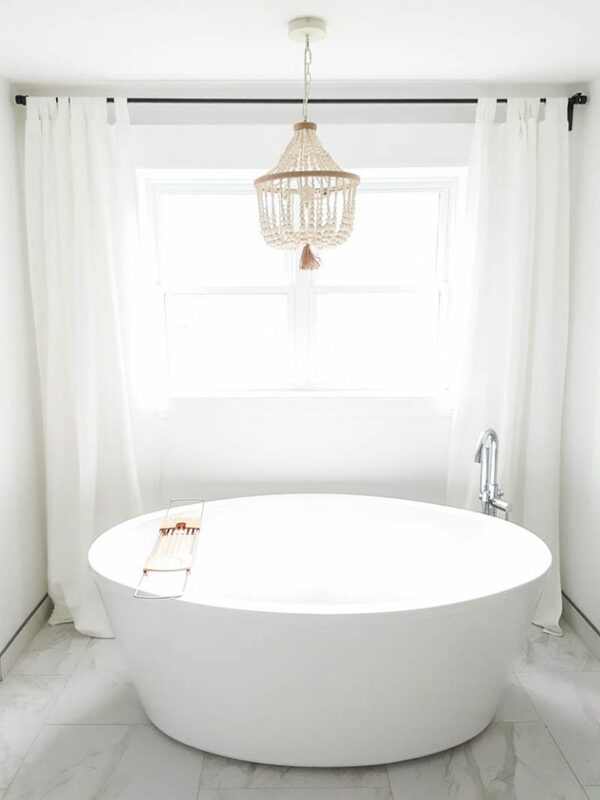 I knew wanted a white tub – something classic to stick with my all-white and marble design. We are on a budget for this room (aren’t we always?! ), so when I saw that Costco had a soaker tub with faucet for less than $1000, we were like “start the car!!!!”. 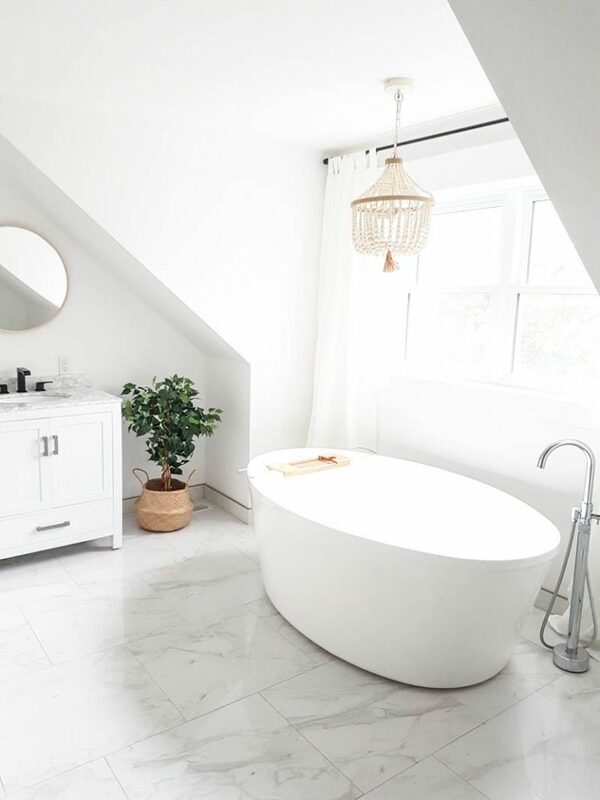 If you’ve ever looked at freestanding tubs, you’ll know that they can easily be upwards of $3k. The one we got is the Betsy 67-inch bathtub with Athena freestanding Faucet (here). It retails right now on the Canadian site for $1499, but we got it on a special buy for less than $1000 (all taxes included). My recommendation if you are looking at tubs, is to do your research at all your local department stores, and then watch for sales. If you have already done the research and know what you want, it will be easy to pull the trigger when you see a great deal. 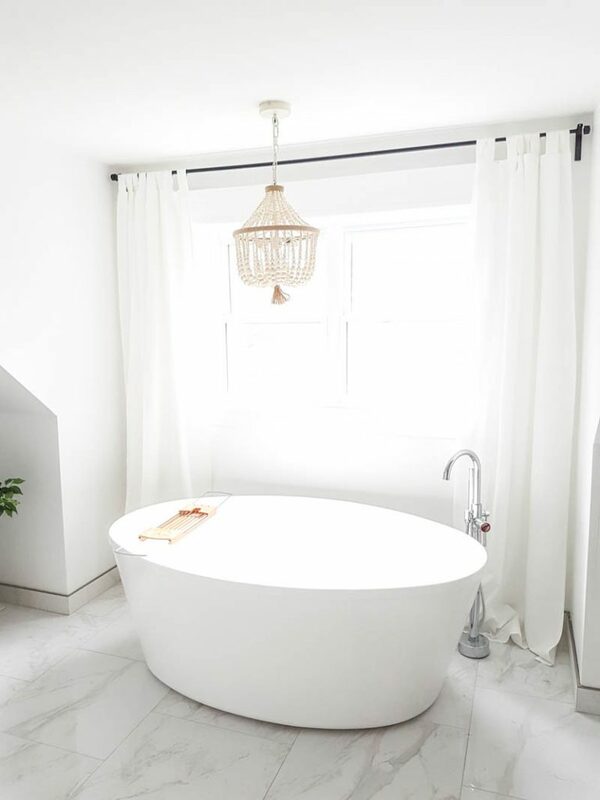 The tub was delivered and installed, and instantly made the room feel majorly swank. Then it was time to figure out lighting. I knew I wanted a special light fixture for that nook of the room. Because there was blonde wood tones happening in the mirrors above the vanity, I thought I’d bring over that same vibe. I looked around for wood chandeliers, and fell in love with the Dahlia chandelier from Pottery Barn Kids. I usually go really budget on lighting – either thrift stores or big hardware stores – but this time I was okay with splurging. Anything over $100 on lighting to me is a splurge, so this chandelier at $249USD was definitely a bigger price tag than we usually pay. But I felt really strongly that it was going to add so much to the room. 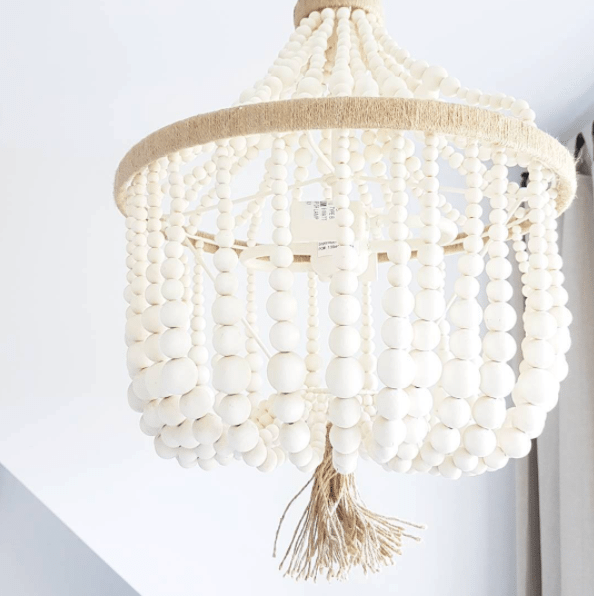 I love the way the light wood brings warmth to the room, how the beads drape around the light fixture, the tassel hanging off the bottom, everything. I compared all of the wood bead chandeliers out there, and I really don’t think you can get a prettier one for less. I would 100% buy the Dahlia again. For the windows, I stuck with my tried-and-true formula: a plain black curtain rod and white drapes (‘Lenda’) from IKEA. Affordable, clean-looking, simple. Always a winner. We may add some bamboo blinds down the road, but for now are going to keep it like this. Stay tuned to see how the rest of the room comes together! We’ve got our tile guy coming to help put up the shower tiles shortly, and I’m hard at work transforming a dated dresser into a beautiful piece to store our towels and linens… the room reveal is coming soon! 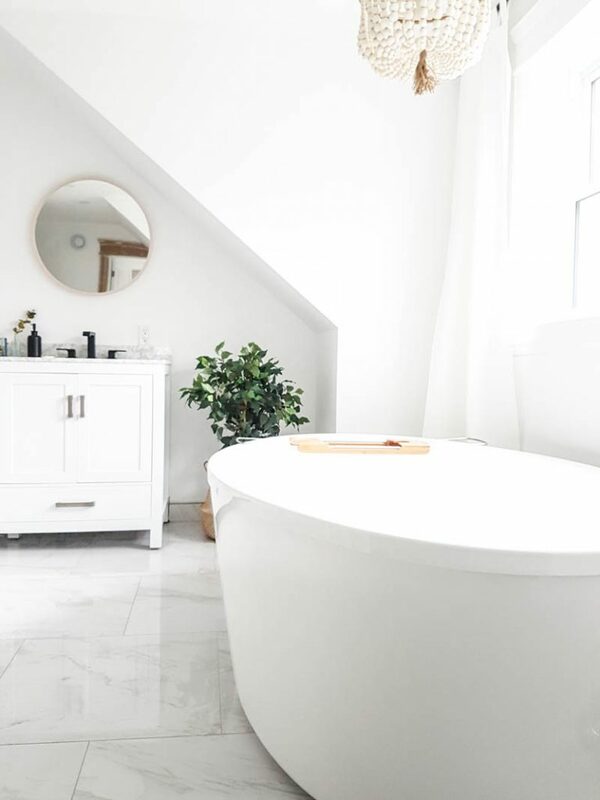 LOVE this bathroom, Gemma! It feels so clean and refreshing! Great job! HI! Can you share what tiles you used in your shower? THanks!